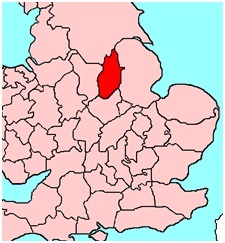 The presenter had previously successfully overseen a similar competition in the neighbouring county of Derbyshire. 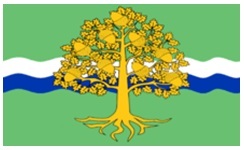 As with his previous venture the competition was initiated by suggestions from his audience, in this case Jane Bealby and Mike Gaunt who independently contacted the presenter asserting that the county needed a flag for the Nottinghamshire public to fly. Andy Whittaker’s previous success may have encouraged the idea. 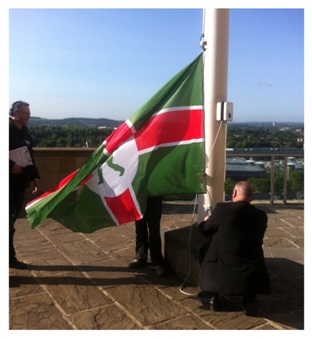 The response to the suggestion was overwhelmingly positive and contact was duly made with the Flag Institute. A panel of judges was formed, which included Alex Farquharson, the director of city art centre Nottingham Contemporary, the Flag Institute’s Michael Faul, card designer Rachel Church, local businessman Mich Stevenson, graphic designers Jason Holroyd and Simon Dun and the two listeners whose contact prompted the competition, Jane Bealby and Mike Gaunt. The panel assessed all the drawings, ideas and feedback sent to BBC Radio Nottingham to come up with the final designs. 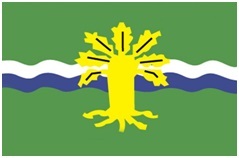 Most of the feedback received, indicated that the flag should feature a prominent symbol of the county. 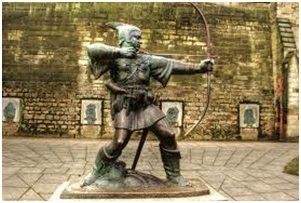 The most popular symbols were the figure of local legend Robin Hood and oak leaves. As can be seen below, crosses and arrows also featured prominently. by combining elements from the various ideas submitted. 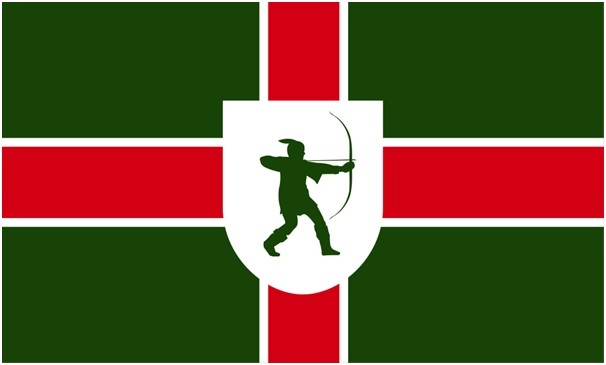 Thousands reportedly voted in an online poll, resulting in the choice of the third design above, the white edged red cross on green, bearing a green archer on a white shield (inescutchon) as the flag of the county. between the 1950s and 1970s. 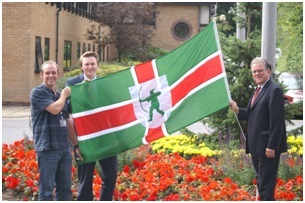 The county flag also adorns the Tourism Centre in Nottingham. 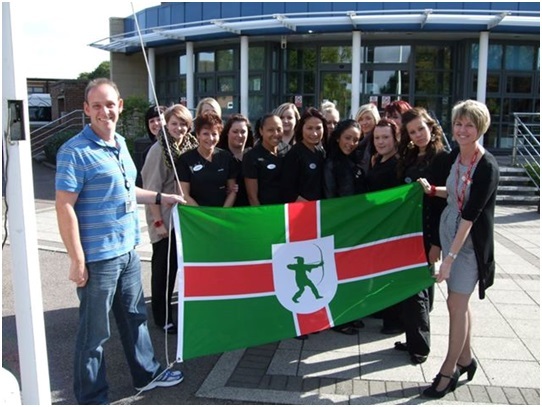 The flag is also used by businesses to promote their Nottinghamshire identity. 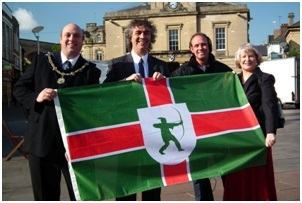 The county flag therefore clearly reflects a centuries old tradition, real or mythical, of being represented by the famous archer. and as such is its property alone and represents only the council not the county as a whole. 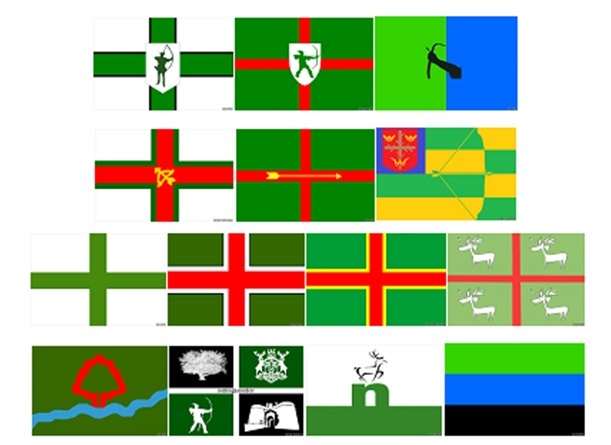 It is not the county flag. 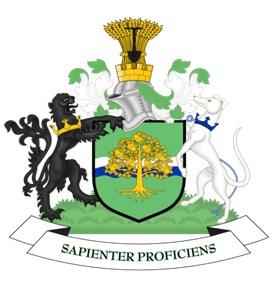 This entry was posted in Nottinghamshire. Bookmark the permalink.